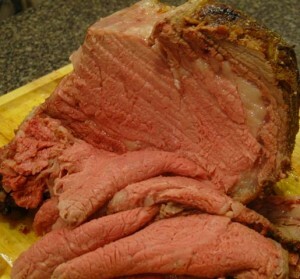 Prime Rib is one of my favorite “special occasion” dinner meats, because it is so flavorful with very little additional seasoning. Today I will share my Prime Rib roasting experience with you. You will be quite surprised how simple it is to prepare, and how impressive and tasty is the outcome. My dutch oven was a great vessel to roast it in, but any heavy pan will do. Remove the meat from packaging, and rinse off, or wipe it down with damp paper towel (I always like to rinse my meat before cooking....just because...). Place the meat on a platter, on the counter, and leave it out for 2 hours uncovered, (to get it to room temperature, and for the outside surface to dry up a little). Place the meat in a roasting pan, ribs down and fat side up (I used my Dutch Oven). 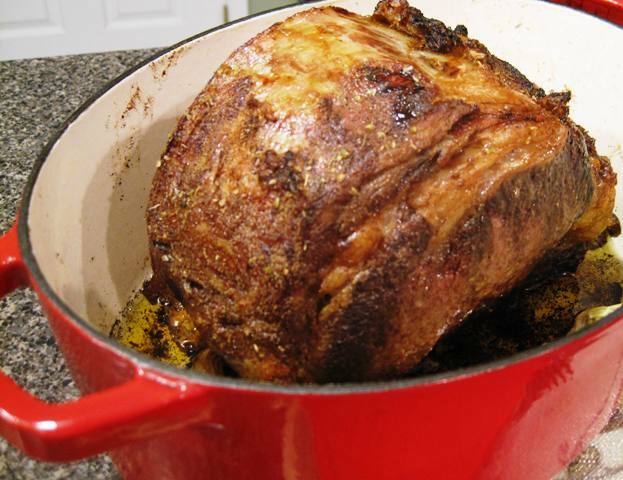 Using a basting brush, baste the olive oil all over the top and sides of the meat. In a small dish prepare the meat rub, by mixing together the Garlic Powder, Onion Powder, Paprika, Black Pepper, Italian Seasoning and Kosher Salt (see TIP below). Spread the meat rub all over the oiled meat. Add the onion, garlic, bay leaves, peppercorns (and Rosemary is using). 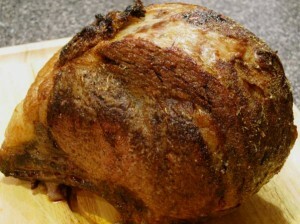 Roast the meat in a preheated over for 3-4 hours, basting from time to time. It is very important to have a good quality meat thermometer, to check the temperature of the inner part of the meat, to reach 125-130 degrees F. Start checking the temperature periodically after 2.5 hours of cooking. If you like to have your meat medium done, remove it from the oven once the meat reaches 125 degree F, cover loosely with aluminium foil, and let it rest for at least 20 minutes or even an hour, at room temperature. The resting period is very important, to keep the juices in the meat, making it very tender. Before serving, remove the aluminum foil, and cut off the ball of the meat away from the ribs, running the knife along the side of the ribs and meat. Wrap the ribs and refrigerate for future use, to prepare Prime Rib soup stock. Slice the meat against the grain, into serving slices (thin or thick...your preference). Serve with your favorite gravy, incorporating the juices remaining in you roasting pan. My favorite is Au Jus gravy , served with Prime Rib. Some cooks prefer to omit the salt, because they feel it draws the juices out of the meat during cooking, but I like to flavor my meat with salt. If you prefer to have a crusty top on your meat, you can first roast it at 425 degrees F for 15 minutes, then lower it to 275 degrees until done to your preference. I prefer the meat being tender evenly throughout, hence cook it at the lower temperature from start to finish. DO NOT cover the pot, and DO NOT add any liquids during baking time. During the last hour of roasting time, you can bake some russet potatoes in the oven, to serve with the roast.